Community Blog by FAILCAST // Failcast Episode 1.1: Cowzilla Rampage!! 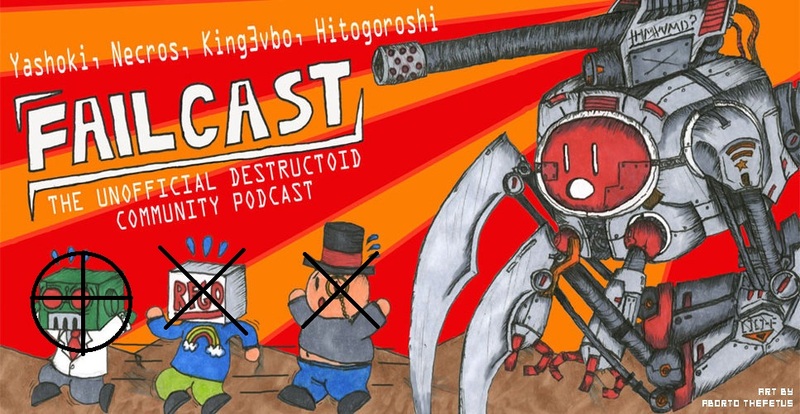 Failcast Episode 1.1: Cowzilla Rampage!! In the aftermath of the wildly successful kaiju film Cloverfield, the Failcast team knew we had to attempt to film our own. How hard could it be? It's basically a bunch of shaky camera shots and off-screen sound effects, well within the reach of Necros' degree. Alas, we soon discovered a flaw in our plan: the monster we were planning to use, Cowzilla, had other plans involving young girls and giant udders. You can guess that this combination did not have a happy ending. So Necros and King3vbo settled for interviewing Cowzilla, who is neither a giant cow monster or an angry banana, for our preview of episode 2. Unavoidably, we ended up talking about how awesome his What Happened! column was, and how we would sacrifice our left nuts to have it back. Cowzilla also sets the record straight about how your blog may not actually have been all that special. It's okay, we're sure your mom thought it was cool. As always, look forward to our full episode next week. If you have any blogs, videos, images, or related fail, send it to [email protected], and we promise to pay Mexican workers to look at them for us. And of course, the same method applies if you want to get on the show and have one of these segments all to yourself. Stream the fail! It works now!